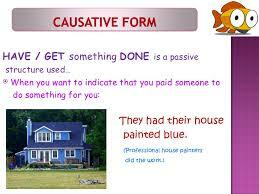 CAUSATIVES: TO MAKE somebody DO something/ To HAVE something DONE. 1) Kyle made his younger sister work. 2) Kyle had his younger sister driven home. In sentence 1, the verb in the infinitive has an active meaning: The young sister has acted! She has worked! In sentence 2, the verb in the infinitive has a passive meaning: The young sister has endured the action! She was driven home. Once that distinction between active and passive forms has been made and understood, things are becoming much simpler! - To make us lose weight, they starve us. - Chris will make us miss our train if he doesn't arrive now. « us » is the DOC (direct object complement) of 'make' and the subject of 'miss'. 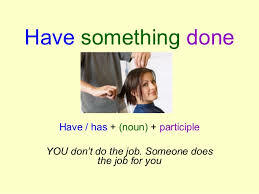 The subject of the sentence and of the main verb (make) is initiating the action, but not doing it himself/ herself. In the United States, and in other countries, or regions, 'make' is often replaced by 'have' in that construction: The police had the witness tell them what he saw. - He was made to hand over the money he had stolen. - My parents got/ had the living room repainted. - They had a new school built. In those two sentences, the actions were passive: The living room was repainted. The school was built. The actions were really endured. - Dad will have his car repaired at the garage because he can't do it himself. - Mum had/got her purse stolen and reported it at the police station. 3) A few cases are exceptions... (alas!) and will have to be learnt because they don't obey the 2 rules! - to make oneself understood/ heard/ obeyed/ respected. 1. You should apologise for being rude. If you don’t, you’ll be make to domade domade donemade to domade doingI don't know it and you’ll be ashamed of the humiliation. 2. I like this teacher. Of course, he makes us to workmakes us workingmakes us workwas made workI don't know a lot, but he’s quite passionate and interesting. 3. Tomorrow afternoon, I’ll take Silky to the vet’s to have him to vaccinateto make him vaccinateto have him vaccinatedto get him vaccinateI don't know . He won’t like it. 4. During the rugby match, Philip was tackled and have his ankle sprainedhave his ankle sprainingmake his ankle sprainhad his ankle sprainedI don't know . 5. When I arrived in Italy, I couldn’t understand a word of what was said and it was very difficult to make me understandmake myself understoodget myself understandhave me understandingI don't know . 7. Please, be sure to leave on time not to keep your father waitinghave your father waitingmake your father to waitI don't know . He doesn’t like it.